Description: The male silver pheasant is immediately identifiable by his white back and tail with thin black bars, his red facial wattles, black crest and black underbody. The female is brown with smaller facial wattles and a small black crest. Both males and females have bare, red legs. 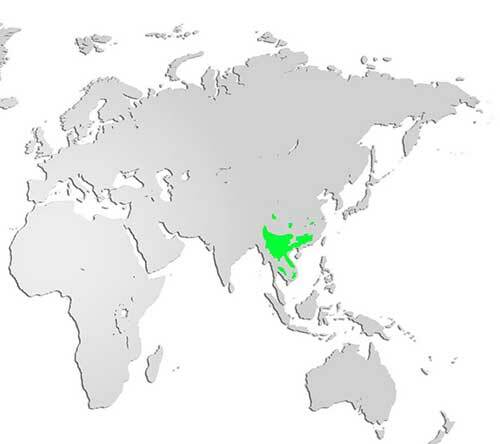 Distribution and Habitat: In the wild, silver pheasants have many subspecies and are widely found across Southeast Asia. Like many other pheasants, they prefer to inhabit high-altitude forests. Diet: Omnivores, silver pheasants forage for seeds and plants as well as insects and worms. Life Cycle: During breeding season, these pheasants don’t form pairs; instead they mix in a polygamous group where one male may mate with several females. The female silver pheasants scrape a shallow nest in the ground and lay varying size clutches which incubate for just under a month. Chicks remain with their mother for a short time and then fend for themselves. 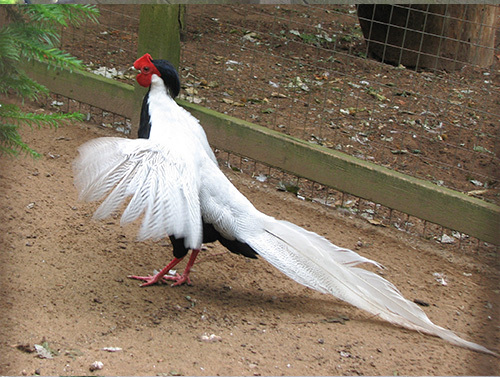 Male silver pheasants will achieve their mature plumage in their second year.